How does one in a few minutes pay tribute to a lifetime of achievement? It is just not humanly possible. So today, and in the days ahead, we can only provide snapshots of a glorious life once lived. Time does not permit me to chronicle the monumental achievements of this woman. Time does however permit me to say thank you and good bye. The Bible tells us in Ecclesiastes (3:4) that there is an appointed season for everything… “a time to weep and a time to laugh, a time to mourn and a time to dance.” I believe that today we should do both - weep and laugh, mourn and dance, because that was how Debbie would have dealt with this occasion. A torrent of memories and of songs, sounds and symbols came to me as I sat to prepare my thoughts on Debbie, and so I share these few words being ever mindful that I speak not just for myself but for the dozens of individuals who served with her in the Georgetown City Council from 1994-1998 and in the 7th, 8th, 9th, and 10th Parliaments of the Republic of Guyana. I speak as well on behalf of the Speakers of the Parliaments of Dominica and Belize who have asked that they be associated with this outpouring of grief, sorrow and celebration that are being expressed today. The presence of so many of us here today is honour enough, as it fulfils biblical scripture that tells us:- “whosoever shall exalt himself shall be abased; and he that shall humble himself shall be exalted.” Today, we exalt you Deborah Jan Backer. On a personal note, Debbie was as close as a sister as I could have. She treated me as her brother by providing the requisite doses of encouragement, and support, and when necessary, of correction. As a legal colleague, she was worthy, upstanding and outstanding, and as a fellow soldier and comrade she was the kind of person you would want next to you in any battle. Her bravery, assiduity, perspicacity and political prowess vastly exceeded that of many men and women...combined. Even when I left the PNC to form the AFC, our friendship did not diminish; though I know my friend was very displeased. I recall vividly when in the 2006 election’s campaign Debbie was despatched to New Amsterdam, a place I thought we had “locked” and in one evening caused confusion when she proclaimed at New and Main Streets, “AFC is not Trotman, don’t worry with he…AFC means All For Corbin”. Needless to say, it took a lot to recover, but we did, to a large extent. We both laughed the next time we met. Debbie could twist any set of words into something both humorous and bitingly satirical. Every year she would re-title the Budget, much to the chagrin of the Minister of Finance and of course to the delight of us all. Though I believe that secretly the Minister was just as amused. Debbie was in a category of a new breed of politician who had joined the PNC after 1992. These were individuals who did not participate in, or were victimised by, the horrors and travesties of the 1960’s through to the 1980’s. 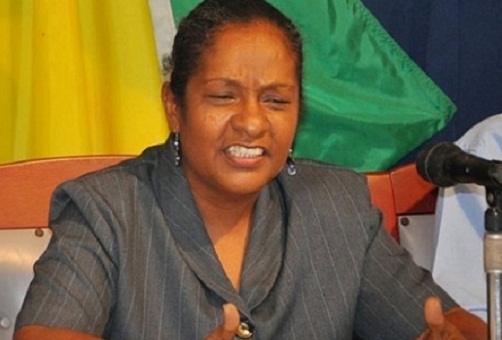 So it was in 1994 when she chose to become a member of the PNC and subsequently, to take up service on the frontlines as a Councillor for the Georgetown City Council, it was not to enter into a racial or tribal battle as Debbie herself would tell you that being half East Indian and half African disqualified her from harming either race. Rather, her fight was for justice, equality and of course “a good life for all”. Her fight was for Guyana. And like those of her generation, she believed that in a country where the dogmas and ideologies of the various ethnic and offspring political groups were set and, and where the strengths and weaknesses of the various competing and colliding groups were almost equally matched, that no one race, group, political party or person possessed the intrinsic capacities to cohesively and effectively manage and develop this richly endowed country. We have been tilting at windmills for too long. Many souls have been lost and more will go to the great beyond without much being accomplished; unless and until we accept that we must sit and talk, and after talking, to start walking together. This is the message that Debbie communicated to me on the several occasions when I visited with her. During these times, She repeated a very personal and profoundly inspiring story which she would have wanted me to share with you. It was that when at the time when her latest bout of illness struck, she was afraid and deeply concerned, that she telephoned Dr. Jennifer Westford, the Minister of Public Service – Debbie’s political opponent. Not only did Dr. Westford drop whatever she was doing, but she arranged for Debbie’s admittance to hospital and stayed with her for endless hours on that day and many days thereafter. “Do you see over yonder, friend Sancho, thirty or forty hulking giants? I intend to do battle with them and slay them. With their spoils we shall begin to be rich for this is a righteous war and the removal of so foul a brood from off the face of the earth is a service God will bless." The people we fear, most often are the people just like us, are just as afraid, and are certainly not monstrous windmills. We live in a moment that Dr. Martin Luther King jnr. would have described as the “fierce urgency of now”. The people demand leadership, and leadership demands action. And so I implore those who wish to preserve Debbie’s memory and legacy to recognise that she can be best honoured if we embrace what she stood for, fought for, and regrettably, died for. We can pay tribute by ensuring that her memory is not forgotten and the foundation of her good works continues to be built upon. Not merely by talking the talk, but by walking the walk. On behalf of every member of the Georgetown City Council, and municipal staff, and on behalf of every Member of the 7th, 8th, 9th and 10th Parliaments of the Republic, and also on behalf of the Clerk and staff of the Parliament Office, we all offer our heartfelt condolences to you Steve and to Nigel, Natasha, Kim and Brian, and to the sisters, and all other relatives, friends, associates and comrades of this fearless lioness Deborah Jan Osman-Backer. May God grant you Debbie eternal rest from your labours and cause his countenance to shine on those whose weeping endures. So that in the morning there will be joy because we can say Debbie lived, she laughed, she laboured and she loved. Thank you Debbie and farewell - until we meet again.